Tennis may be the focus of Wimbledon, but as the world's most famous tennis tournament continues, berry farmers are reaping the rewards. Since 1877, strawberries and cream have been to tennis what hot dogs have been at countless other sporting events. In fact, tennis aside, strawberries have become one of the touchstones of the tournament. As tennis stars expound on Wimbledon's snack of choice, Instgrammers snap pictures of them while food bloggers review them and chefs in the United Kingdom offer tips on the best way to recreate the club's berries and cream at home. U.K. strawberry growers credit tennis for a boom in exports. 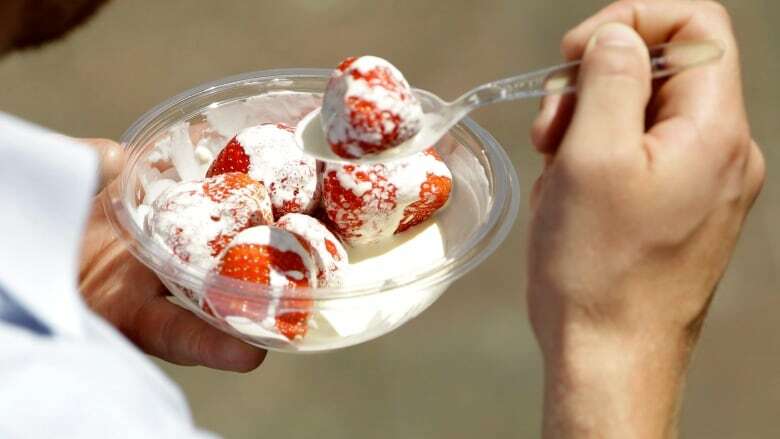 According to government figures, last year 1,000 tonnes of British strawberries and 33,000 tonnes of cream were exported to 56 countries. The global impact might be new, but the tradition itself has Tudor roots. The combination of strawberries and cream was first introduced by Cardinal Thomas Wolsey, a high ranking-official in the court of Henry VIII. Before that, dairy was reserved for lower classes, and royal desserts were rarely so simple. The tradition was adopted early in Wimbledon's history, partly in response to the fashionability of strawberries in 19th-century London. After all, they were available for only a few weeks a year — weeks that happened to coincide with a tennis tournament attended by the city's upper crust. In an age before refrigeration, seasonal strawberries were a luxury, and eating them in public was a sign of prosperity. These days, eating strawberries in public is hardly a sign of prosperity. That honour is now reserved for tennis fans who can afford tickets to see the matches. According to online ticket reseller StubHub, the Wimbledon men's final tickets are currently listed at $23,000 Cdn each.